I’m putting together gift baskets for the upcoming crafts fair season. There are two sizes. 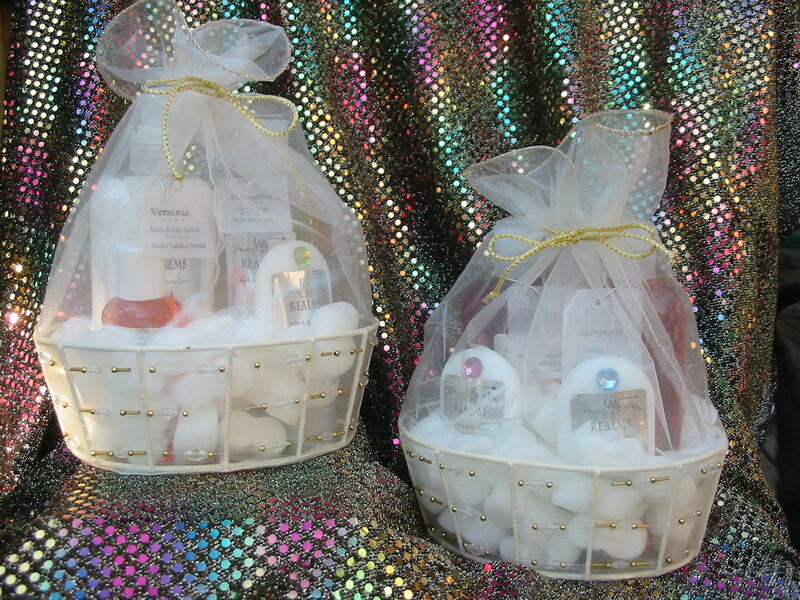 The smaller square basket holds 4 lotions or shower gels in the mini-size only. The larger oval basket can be filled with all of the Realms products, including foaming hand soap and room spray. At least two of the items need to be the large 8 oz. size in order to hold the basket’s shape. I’m really pleased at how well the translucent organza wrap works. I’ve always been in love with scents. Ever since I was a little girl and my best friend’s mom let us harvest the petals from her roses to make “perfume,” the fascination has grown. Now, the window ledge in the shower is full of shower gels and the cupboard full of lotions, most all of which are my own making. 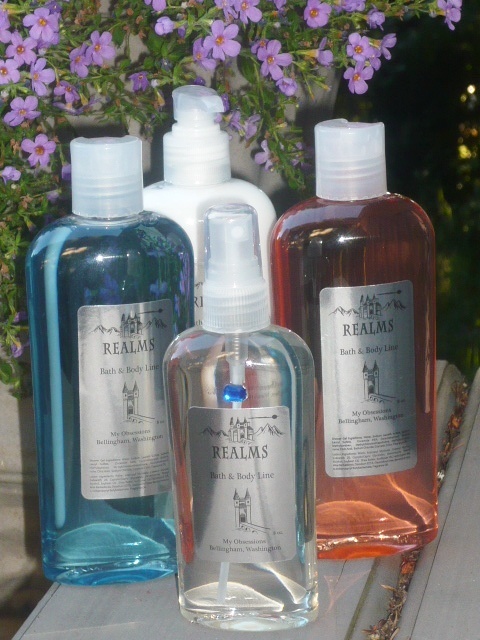 I created Realms Bath and Body Line a couple years ago. I started with shower gels and lotions, then added crystal potpourri, and this year added room spray and foaming hand soap. I have these scents so far, but add more all the time. Zangezur is my latest; I just put it in the line-up last week. It makes a luscious shower gel and hand soap. Now in beta, thanks to my beaming, beautiful daughter-in-law, Mindy who’s expecting in January — NaPali Satin & Silk Lotion for Moms-to-be, with a healthy dose of Vitamin E oil for elasticity to prevent stretch marks. Give me a few about 4 months and I’ll let you know how it works.